Put all the documents in the London Metropolitan Archives (LMA) back-to-back and you've got a paper trail stretching over 100 kilometres. LMA's records date from 1067 and go right up to present day London. In this empyrean of recorded history, you can find anything from Hogarth engravings, to Crystal Palace extension blueprints, to 1930's adverts for the city's tramways. LMA is also the place to locate long-lost London ancestors. Although there's nothing like leafing through the collections first-hand, you can also search the catalogue online. Watch out for special events, like this upcoming day exploring London's Scottish connections. 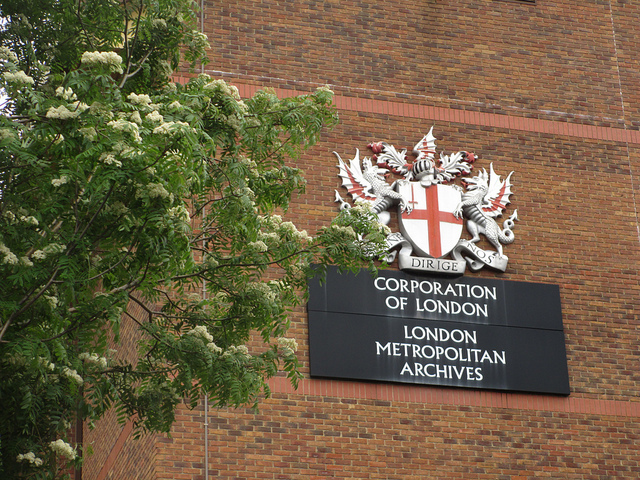 London Metropolitan Archives is open Monday-Thursday, and one Saturday each month. It's tough knowing where to start at Guildhall Library. There's been some kind of collection here since the first half of the 15th century, so you can imagine how much material there is now. Actually you don't need to imagine. There are over 200,000 books, pamphlets, periodicals and suchlike, as well as special collections focusing on Samuel Pepys, Charles Lamb, The Worshipful Company of Clockmakers and more. This is officially the largest collection in existence devoted to the history of a single city: officially impressive. Guildhall Library is open Monday-Saturday. 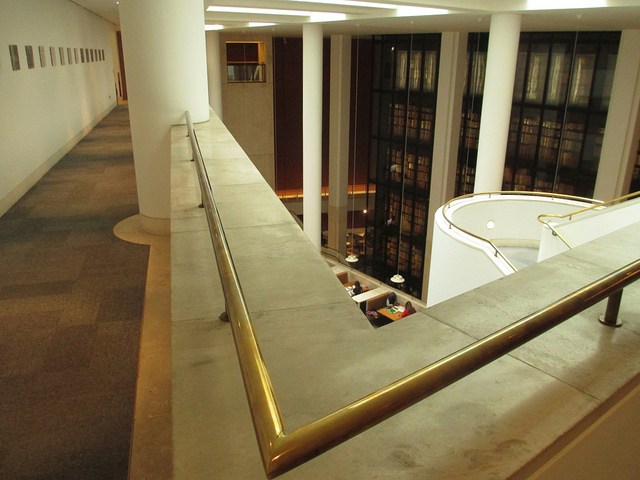 Listen to Londonist Out Loud's recent visit to Guildhall Library. Though not dedicated solely to London, the London Library makes this list on sheer clout alone. Founded in 1841, the plush St James's Square library has more than one million books and periodicals available to its members. Many of the titles here are antiques (some dating back to the 16th century) and what's more, you can take many of them home. You needn't dress like Mycroft Holmes to peruse – anyone can sign up – but the monthly fee isn't exactly cheap. Then again, if you want to share in a library that has welcomed George Eliot, Kingsley Amis, Arthur Conan Doyle and Virginia Woolf as members, this is the place for you. The London Library is open Monday-Saturday. The British Library holds about 14 million books. Not even Stephen Fry has read them all. Of marked interest to the Londonphile is the Crace Collection – a mouth-watering stockpile of over 1,200 maps and plans accumulated by Victorian society designer Frederick Crace. Documenting the shifting shape of London between 1570 and 1860, the Crace Collection is an inestimably important record of how the city we know today came to be. One curator's choice is a 1653 “guide for cuntrey men in the famous cittey of London by the helpe of wich plot they shall be able to know how far it is to any street.” The British Library is open daily. Read about our journey into its deepest depths. Aside from spoiling us silly with talks and courses, the Bishopsgate Institute also has an illustrious library. London is covered from just about every angle, although the Bishopsgate's library specialises in labour and socialist history, protest and campaigning and lesbian and gay press. Possibly the strangest book we found on the wonderfully-windowed shelves was Sean Manchester's The Highgate Vampire. Bishopsgate Institute Library is open Monday-Friday, from 10am-5.30pm most days. A current highlight from the City of Westminster Archives Centre is The Diary of Nathaniel Bryceson, 1846. It's the daily ramblings of a 19 year-old wharf clerk in Pimlico, and documents everything from his eating habits to his liaisons with mistress Ann Fox. The City of Westminster Archives Centre is inundated with treasures like this; its Westminster-centric cache consists of books, pamphlets, newspapers, journals, maps, prints, photographs, electoral registers, census returns and lots more besides. City of Westminster Archives Centre is open Tuesday-Saturday. You must be a member, and can sign up free here. The first Sainsbury's store opened in Drury Lane in 1869. Since then, an exhaustive collection of the chain's packaging, magazines, reports, accounts, press releases, and even uniforms, has been stashed, and is available to rootle through at the Search Room in the Museum of London Docklands (as well as online). Something else the Search Room has to keep you occupied for half a lifetime is the Port of London Authority Archive – a mind-bogglingly extensive collection concerned with what was once the world's most vital port. The Search Room is currently open Thursdays only. You must book a session in advance. On a less academic note, a visit to either the galleries of the Museum of London or its Docklands site is always good for topping up your London knowledge.